We go through A LOT of bananas with all the smoothies we make, so we usually buy bananas in bulk. Sometimes, they go bad before we manage to use them all. 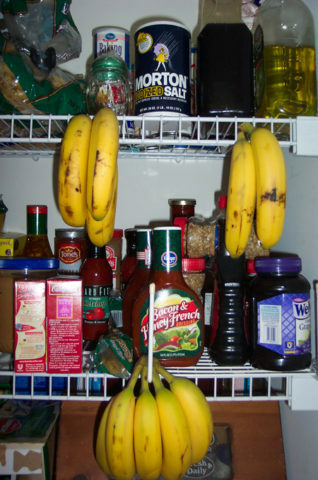 If bananas go bad too quickly for you, too, consider doing what I do: hang the bananas from their stems in your pantry! Unless you plan on whipping up a batch of banana bread every time you’re left with overripe bananas, then you need to find SOME method of prolonging the life of your bananas. FYI… mushy bananas work well in smoothies, too! The best part is my homemade version of the banana stand works great… and it doesn’t cost a penny! Isn’t it amazing how quickly bananas start bruising? It seems like they develop brown spots virtually minutes after you bring them home from the store! I’ve always had the best luck keeping bananas in the refrigerator. They seem to last a tiny bit longer that way. 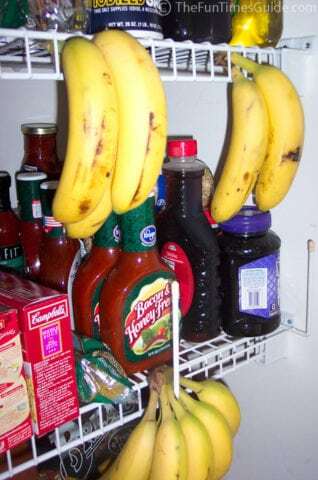 Now I just hang the stems of the bananas between the slats in the shelves of our pantry. Seriously! It’s the exact same concept as those “official” banana hangers… but much cheaper. Plus, the pantry tends to stay cooler than the rest of our house. And the bananas themselves aren’t touching anything… just the stems are. Bananas last much longer this way.